The Britannia Music Scheme, Roden Steet in Ilford has reached its full height! The development, for Durkan Ltd, comprises 354 apartments in four blocks of 9, 10, 13 and 22 stories with ground floor commercial areas. We have continued to demonstrate an appropriate Health and Safety management system that meets the SSIP Core Criteria, which is also in line with Health and Safety legislation. 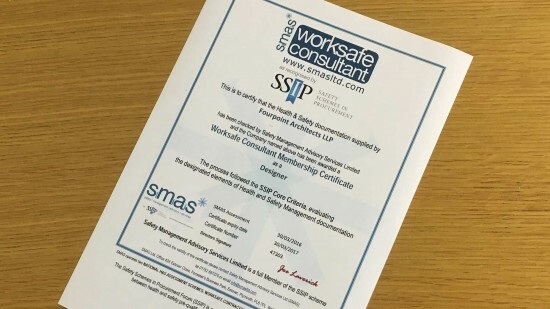 Meeting the SSIP Core Criteria demonstrates that we are serious about Health and Safety, ensuring any work we undertake utilises an effective Health and Safety management system to eliminate risk to health and safety. The Keybridge scheme, for Mount Anvil and A2Dominion​ has be highly commended in the 2018 British Home Awards “Apartment Development of the Year”. The development is located in the heart of London’s regenerated Vauxhall. It comprises of 470 luxury apartments over five blocks, retail and commercial units, residents facilities and double storey basement with landscaped gardens. 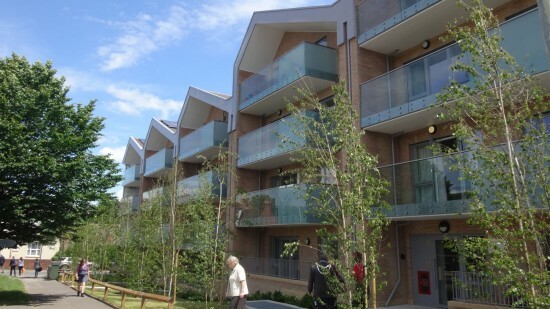 Notting Hill Housing Group‘s Cheviot Gardens extra-care development in South London was Highly Commended in the National Housing Awards 2018 “Best Design Award”. 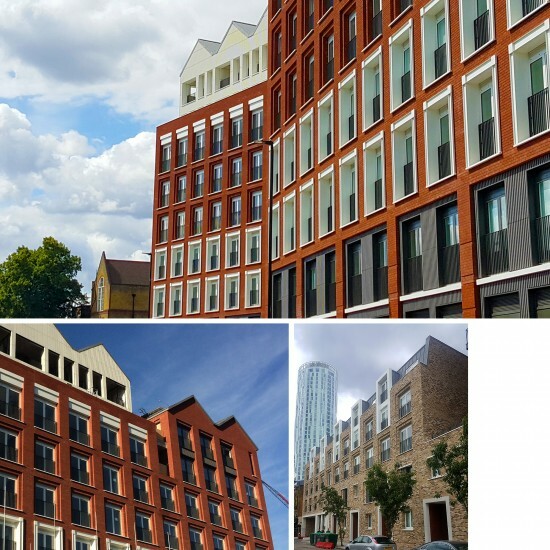 The 66 extra-care units and 18 residential apartments, split over three blocks, was constructed by Durkan Ltd.
Queen's Wharf wins another award! The Queen’s Wharf scheme, for Mount Anvil and A2Dominion has won Hammersmith Society’s Environmental Award for the contribution to the local environment. The scheme has also been highly commended in the Best Apartment (Big Developer) category, at the London Evening Standard New Homes Awards 2018. 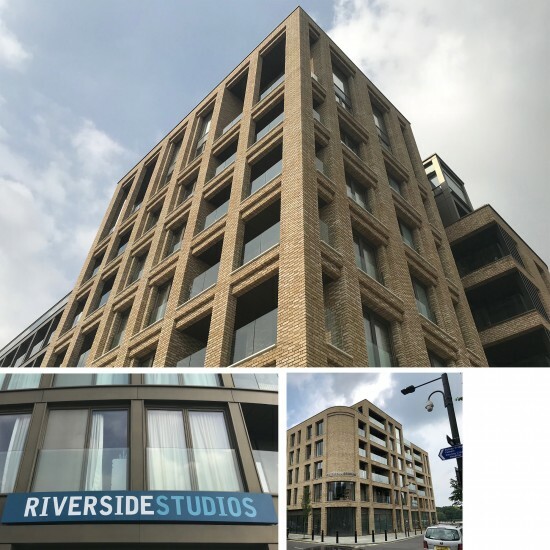 This scheme consists of 165 luxury apartments and a new arts complex for Riverside Studios with recording studios, cinema and ancillary spaces on the banks of the River Thames. Visit the Riverside Studios Development website for further updates. 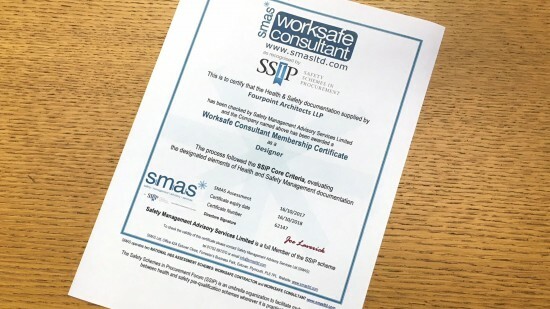 Fourpoint Architects LLP has renewed its “Worksafe Consultant Membership Certificate” issued by SMAS Ltd.
By being awarded this certification we have continued to demonstrate our capability in meeting the SSIP ‘core criteria’ for our Health and Safety Management documentation. 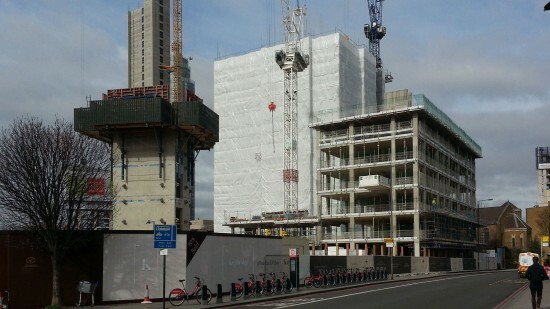 Construction of the structural frame is progressing at Keybridge in Vauxhall, London. SW8. The development, for Mount Anvil, is located in the heart of London’s regenerated Vauxhall. It comprises of 470 luxury apartments over five blocks, retail and commercial units, residents facilities and double storey basement with landscaped gardens. 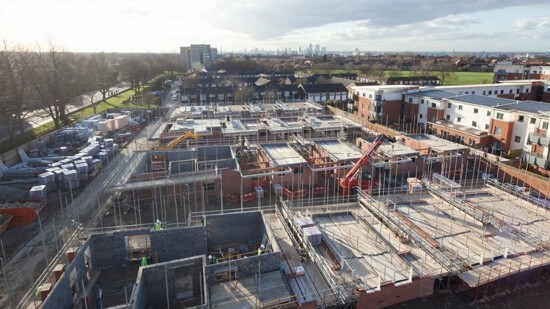 Works are well under way with the construction of the reinforced concrete frame at Higgins Homes’ Morgan Place site. The scheme on the site of a former vicarage to St Mary’s Church, Neasden, consists of 51 apartments and a small commercial unit over 6 storeys with under croft parking and podium deck. Construction at Higgins Homes’ Q development at Queens Road, Peckham, London. SE15 is now complete. The development consists of 47 residential apartments split over four blocks, landscaped terraces and a commercial unit at Ground Floor. 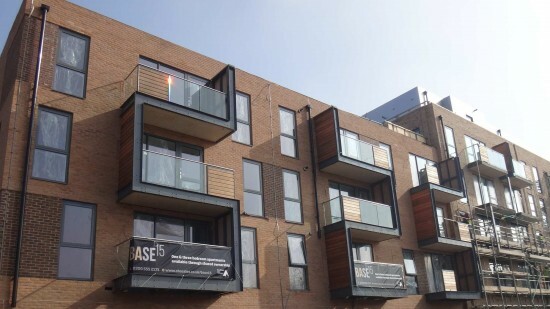 Phase 1, comprising comprised 8 new blocks of flats, at Claybury View, Clayhall, Ilford. IG5 is now complete. 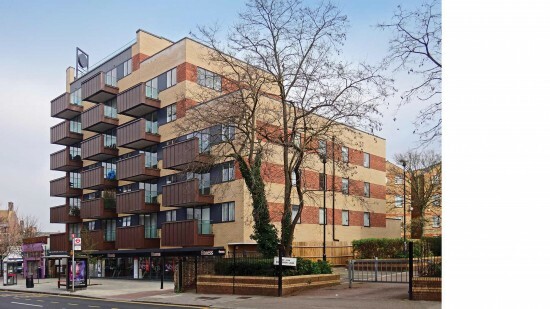 This scheme, for Swan Housing Association, includes the phased demolition of a number of blocks of flats from the 1960’s and the erection of new dwellings to rehouse former residents. 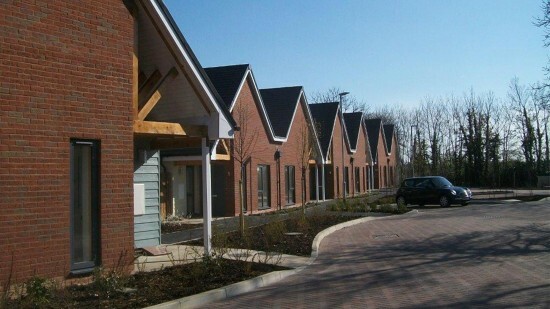 Phase 2, now under construction, comprises 46 houses and 9 new blocks of flats. 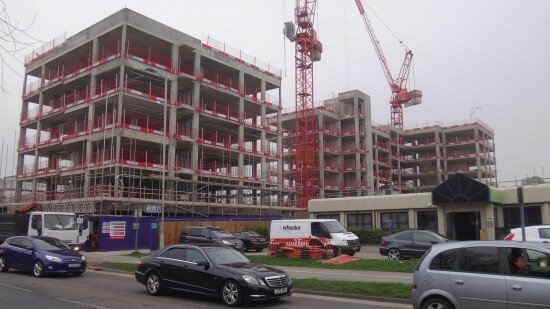 The reinforced concrete farm is nearing completion at Elstree Way, Borehamwood. The development, for Taylor Wimpey, comprises 88 apartments over three blocks with roof terraces and landscaping and is located in the heart of Borehamwood near the famous Elstree Film and Television Studios. 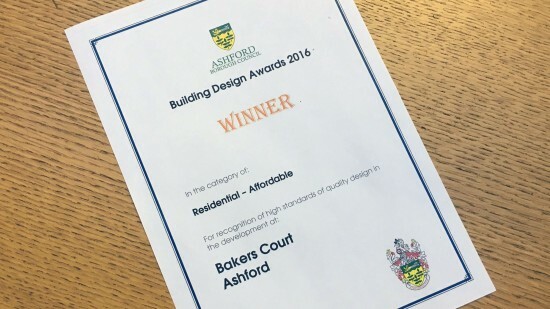 We are delighted to announce that Bakers Court has won a 2016 Ashford Borough Council Building Design Award in the “Affordable Residential” category. This scheme, constructed by Durkan Ltd. for Affinity Sutton, consists of 25 flats, 2 houses, and a landscaped courtyard with parking. Thanks to Affinity Sutton for inviting us to the Awards Ceremony and to Durkan Ltd for a job well done! Higgins Homes’ The Bath House development in Old Kent Road, London. SE1 has now been handed over. The scheme consists of 45 residential units over 6 storeys. 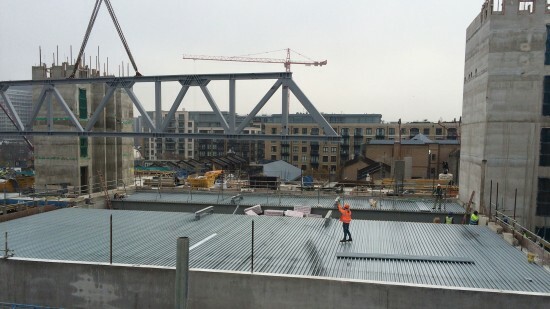 Construction is progressing with the installation of the 27m truss above Studio 1 at Mount Anvil‘s Queens’s Wharf site in Hammersmith. 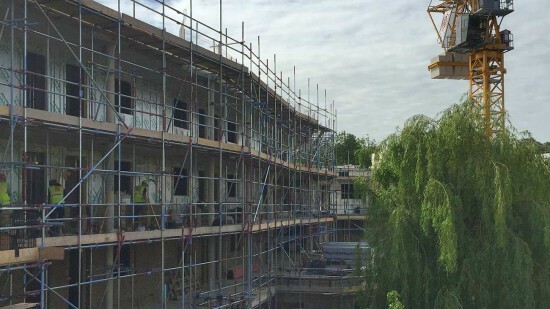 Visit the Riverside Studios Development website for further progress updates. 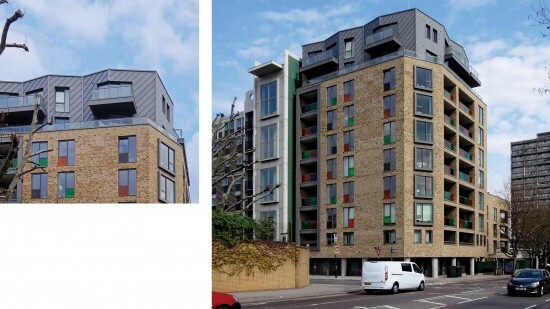 Construction has now been completeted at The Junction, Shadwell, London. E1 for Telford Homes. The development consists of 37 apartments with landscaped terraces situated on the corner of King David Lane and The Highway minutes from The City and Canary Wharf. Electric House has won ‘Best Small Development’ in this years National Housing Awards. 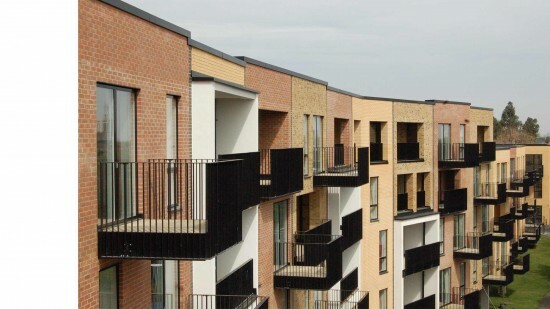 Electric House, constructed by Durkan Ltd for Network Homes, is a mixed use residential scheme comprising a total of 25 residential units and, a commercial unit in Willesden, London. NW2. The development replaces a building, constructed in the late 1930s, that served as an Electricity Board Showroom until 1985. 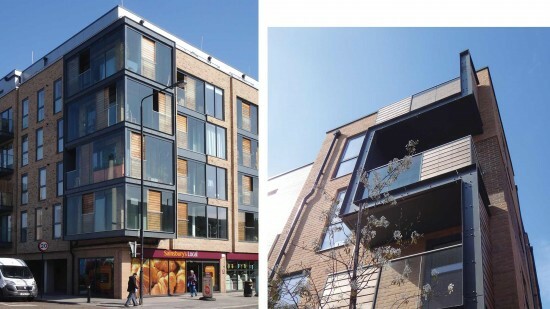 The new scheme provides a striking addition to Willesden High Street, providing a mixed tenure residential scheme of affordable homes helping to provide in-demand housing in the London Borough of Brent. Work is now complete at Bakers Court, Ashford, Kent. 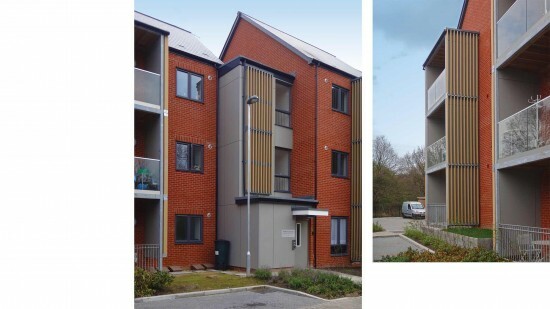 This brand new affordable housing scheme was constructed by Durkan Ltd. for Affinity Sutton, and includes 25 flats, 2 houses, and a landscaped courtyard with parking. 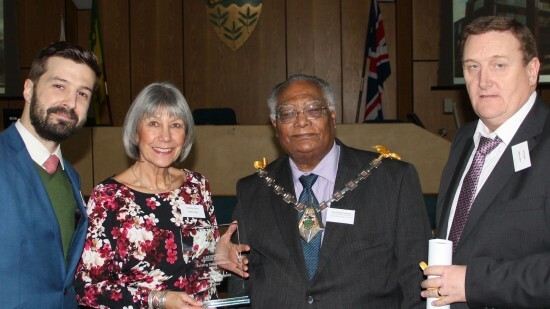 The scheme was declared officially open last week by the Mayor of Ashford, George Koowaree at a ceremony hosted by Affinity Sutton. Many thanks to them for hosting such an excellent event! 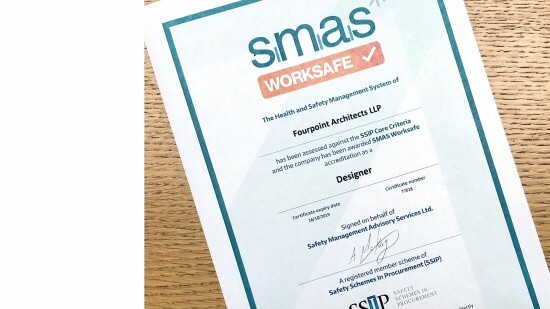 Fourpoint Architects LLP has been awarded a “Worksafe Consultant Membership Certificate” by SMAS Ltd.
By being awarded this certification we have demonstrated our capability by meeting the SSIP ‘core criteria’ for our Health and Safety Management documentation. 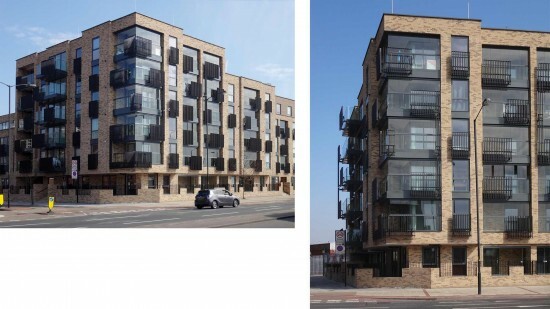 Construction is nearing completion at Higgins Homes’ Q development at Queens Road, Peckham, London. SE15. Queens Road is due to be completed by Summer 2016. 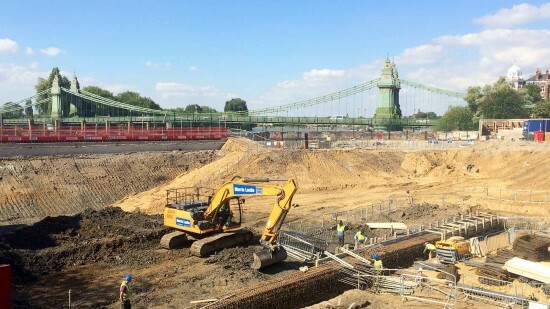 Construction has started at Mount Anvil‘s Queens’s Wharf site in Hammersmith. Visit the Riverside Studios Development website for progress updates. Work is progressing on site with the Cheviot Gardens extra-care development in South London. 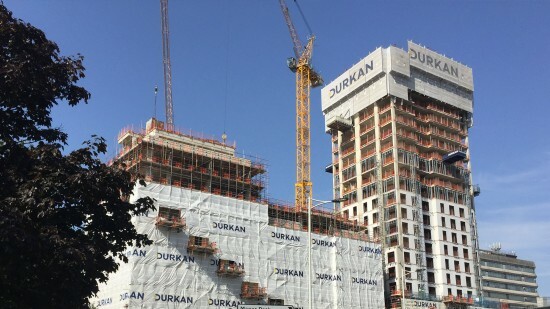 Split over three blocks and replacing existing buildings with 66 extra-care units and 18 residential apartments, Durkan Ltd is due to complete the development later this year for Notting Hill Housing Group. Quadrant Construction works are well underway on the Master Gunners Phase 2 site for L&Q. The proposal sees the demolition of existing buildings to facilitate the site’s redevelopment, providing 64 residential units in a mix of 13 town houses and 51 apartments split across six blocks ranging from three to six storeys. ​18 Affordable Houses and community centre for Keepmoat and Affinity Sutton Homes Ltd have been completed at The Hyde, Welwyn Garden City. 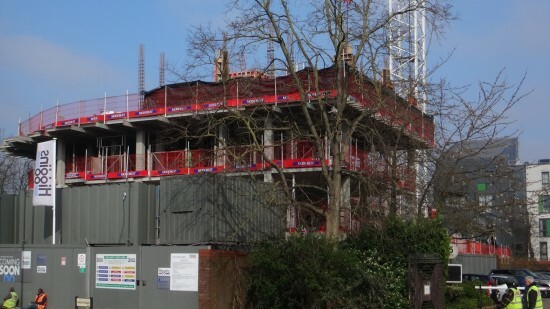 This redevelopment of an under utilised site in Welwyn Garden City provides new affordable housing and a community centre which meets local needs. 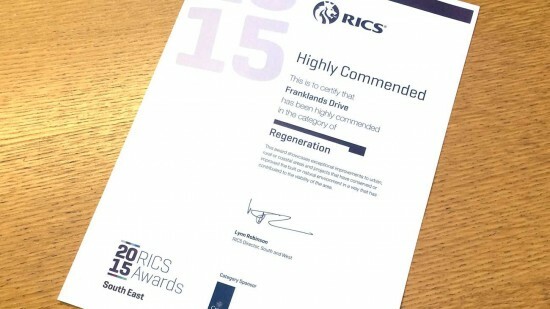 Franklands Drive “Highly Commended” in the Regeneration category at Royal Institute of Chartered Surveyors, South East Awards Programme. RICS were impressed with the regeneration of the neglected woodland and lakes which had become polluted through illegal dumping of rubbish. 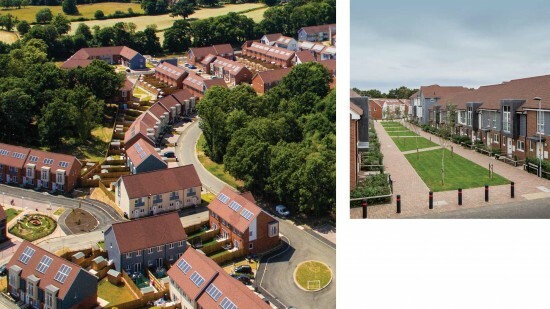 The Franklands Drive scheme consists of 350 flats and houses for Elmbridge Housing Trust (Paragon Community Housing Group) and Durkan Ltd. The development is arranged around courtyards and green spaces providing secure, semiprivate environments for residents to socialise and children to play. Durkan Ltd, has handed over the scheme of 46 apartments and car park, set around a courtyard to Hyde Housing Association and Hyde Vale Ltd. 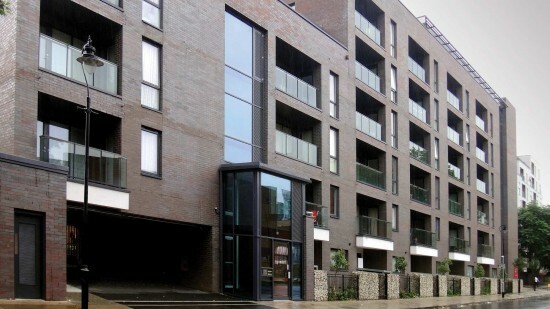 The scheme provides a striking and contemporary addition to the Bermondsey Spa regeneration area, providing a high quality mixed tenure residential scheme with a range of housing types and sizes that enhance the area and helps to provide in-demand housing in the London Borough of Southwark.